The photoelectric rotary pursuit may be used to assess general perceptual motor learning across such parameters as handedness, transfer of training, distribution of practice, and hand-eye coordination. The subject's task is to follow a rotating light with a photocell tipped wand. 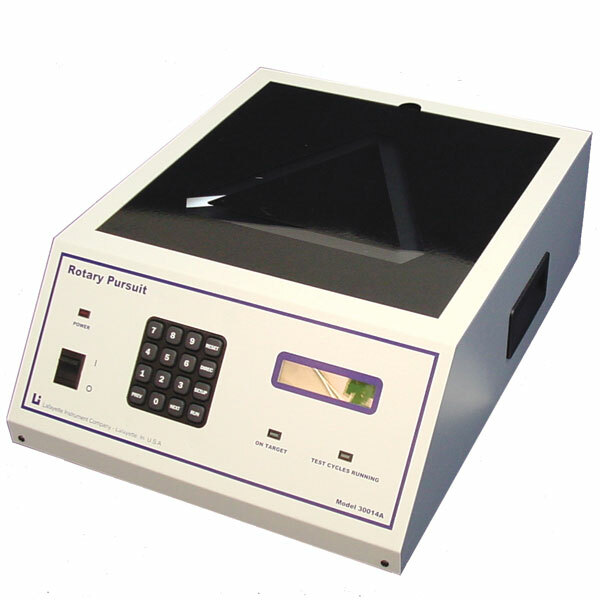 The features of this model provide the examiner with digital control and the ability to monitor many testing variables. The keypad interface and LCD display provide control over the speed of the disk, direction of rotation, test time, rest time, number of test cycles, and sensitivity of the photocell wand. During the test, the unit monitors: the time on target, time off target, number of target hits, number of revolutions completed, and number of test cycles remaining. The unit also allows for computer control and monitoring through a USB port. For countries requiring 220-230V AC 50 Hz operation, - Model 30014C*C is available with localized AC mains cord. International pricing will apply.